In Part Two, Davina and Peter’s big day has arrived and they celebrate their love with their friends and family at a picturesque Nerja wedding venue. The wedding day was finally here and it was all systems go. 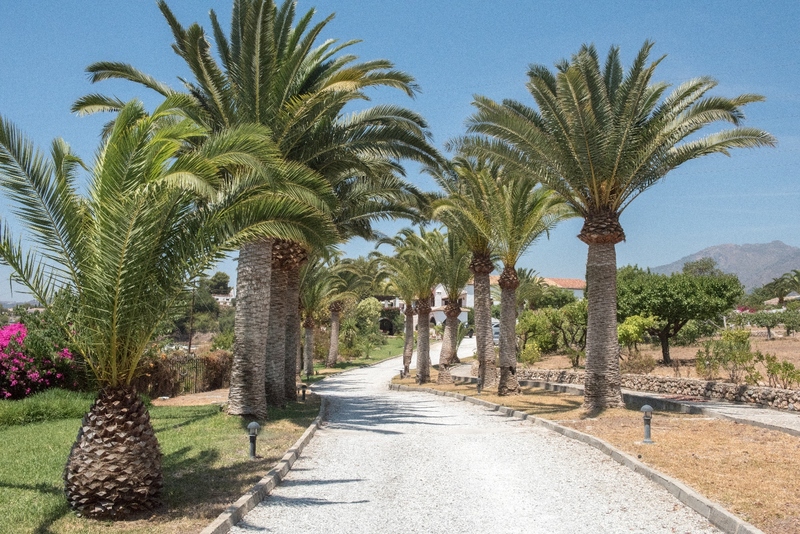 While Davina was being transformed into a beautiful bride at the Cortijo in Nerja, the Sunshine Wedding Spain team began the job of transporting all the wedding guests to a quaint church nestled in the hills overlooking Nerja. The guests were spread throughout Nerja and Velez-Málaga, so organisation was key to make sure everyone arrived on time for the 4pm ceremony. After the romantic ceremony, guests were delighted to be served refreshing drinks and canapés at the tapas bar opposite the church. 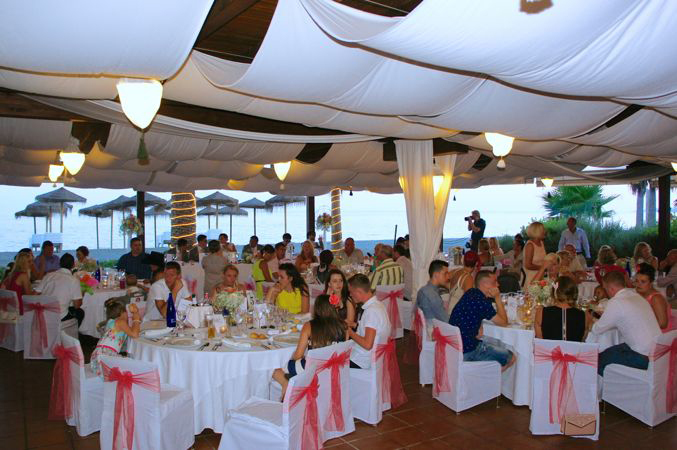 Once everyone had cooled down, the team set about transferring everyone to the reception, which was to be held at the Cortijo. Upon their arrival, they were greeted with a further selection of traditional Spanish canapes; firm favourites were the King Prawns in a Crunchy Nest and Spicy Potatoes with Iberian Pork Loin. Soft music flowed seamlessly from the PA system while guests took in the sensational views of the surrounding grounds. As the sun started to set, the guests were led to an exclusive area of the hotel where the wedding breakfast was to be served. The tables were dressed in crisp white linens which contrasted beautifully with the bright floral décor. Red roses and wild flowers placed in mismatched rustic mason jars and bottles gave these tabletops some quirky charm, while large DIY style wooden numerals were a fun way to direct diners to their seats. Fairy lights were hung across the terrace, adding soft light and romance. The delightful evening meal started with beautifully fragrant King Prawns in a Red Curry Sauce; this was followed by Sirloin Steak, paired with Chestnuts and Caramalised Onions. Those with a sweet tooth dug into the drool-worthy Milk Chocolate Mousse and Caramel and Walnut Biscuit. After the meal it was time to party. Guests were taken inside to watch an explosive performance from K:MiSS – she is certainly a crowd pleaser. With a mixture of Hip-Hop, Motown, 80s to 90s tracks and even latin salsa, there really was something for everyone. To ease hangovers the next day, a chiringuito barbecue on the beach in Torre del Mar was organised for everyone. 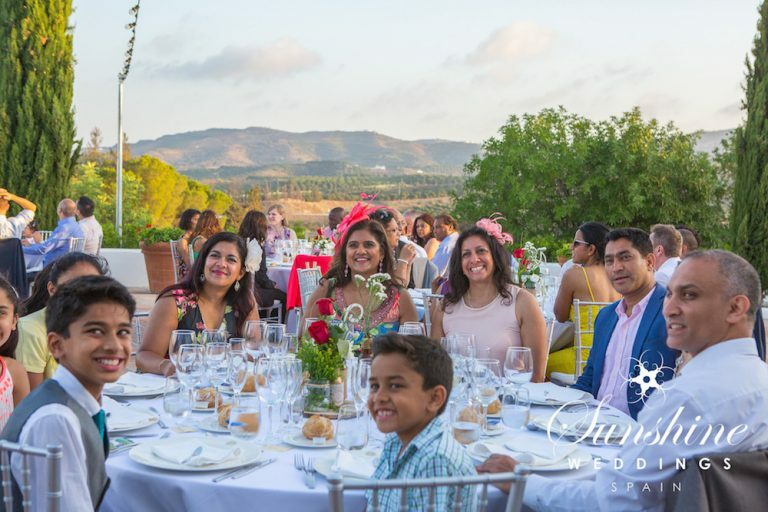 Let’s just say Davina and Peter really spoiled their guests during the three day weekend and the Sunshine Wedding Spain team loved being a part of it.